As wonderful as the Christmas season is for a lot of people, it can also be one of the most stress-full and disappointing times. Paying for Christmas isn’t easy and the effect of all that holiday shopping can haunt you for the next 11 months. In fact, trying to afford Christmas could be the single biggest factor in keeping you poor. That’s why I wanted to create this resource, a reference for Christmas help and how to make the season as happy as possible without busting your budget. We’ll look at the best Christmas assistance programs as well as steps to have a happy holidays without going into debt. The average American family will spend $967 on Christmas gifts and decorations this season for more than $700 billion nationwide. Almost one-in-five people surveyed by GoBankingRates said they expect to spend at least two months’ of paychecks to cover holiday spending. Now I’m not saying you shouldn’t spend anything on Christmas. I certainly do my fair share of spending every year. The problem is $1,000 is more than most people can afford and it sends them into an annual cycle of debt. More than half of American households, over 55 million people, have nothing saved in an emergency fund or otherwise. Even those with a little savings, most say they wouldn’t be able to cover a $400 surprise expense. That means spending a grand or more on Christmas every year could be one of the major factors keeping you poor. Pushing you back into the hole after clawing your way out of debt during the other 11 months. There are ways to get help for Christmas and ways to still enjoy your holidays without inching closer to bankruptcy. I’ll list out the Christmas assistance programs here and then detail a few steps to make your Christmas brighter without spending a lot of green. Some of the programs below are income-based or paired with government programs while others will help anyone that asks. Salvation Army is an all-around Christmas help, passing out toys and helping with bills. The organization can help with groceries and has a hot meals program as well as hands out toys to children with incarcerated parents. Catholic Charities isn’t just for families of Catholics but a wider community-based organization partnered with local food banks to help families with groceries. As a former Marine, I was always proud of the Toys for Tots program. This is a nationwide program to help low-income families with toys for children up to 12-years’ old. The United Way provides assistance and community services in the form of toys, clothing, furniture, utility bills and help with rent. The organization can also put you in contact with other community services locally. Some families may not qualify for Christmas help through the community service programs but that doesn’t make paying for Christmas any easier. Let’s look at five steps anyone can take to pay for the holidays without getting a Christmas loan. 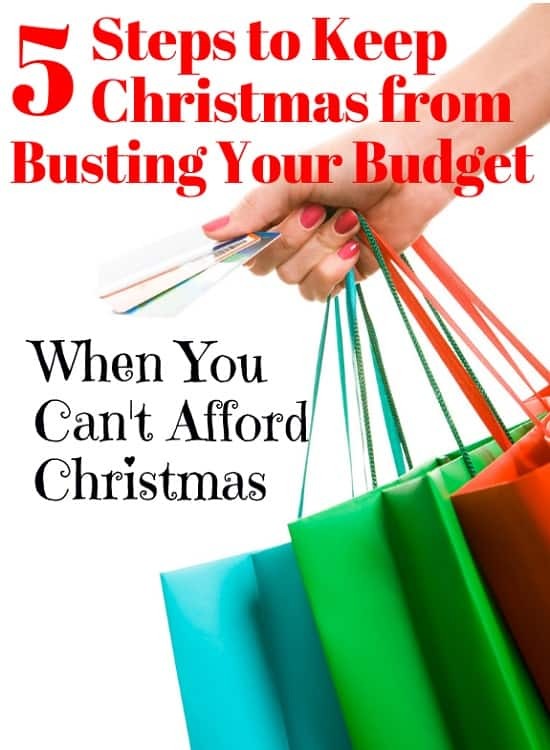 1) First is to see how much you can realistically spend on Christmas. This doesn’t mean how much you can spend if you drain the savings account but how much is left after your bills and making sure you have an emergency fund. Once you have an idea for how much you can safely spend without getting into debt or raiding savings, put that amount on a special Christmas debit card or in a special checking account. Don’t do any Christmas shopping on your other credit cards and don’t pay cash, it all has to come out of that special account. 2) One of the biggest surprises to Christmas spending is how much goes to decorations. People tend to budget for gifts but forget how much they spend on trees, ornaments and other knick-knacks. While those gifts might get used at least into January, the decorations get tossed back in boxes and forgotten for another year. How’s that for wasted money? Look at how many decorations you already have before rushing out to buy more. Stores put their Christmas decorations front-and-center because they know you’ll be quick to spend a few bucks on that Coca-Cola polar bear ornament…but that few dollars adds up to hundreds every year. 3) Think outside the box when it comes to gifts for each person in the family. Does everyone really need three or four or more individual gifts? Think about gifts you can give to the whole family and then give each individual one gift just for them. That doesn’t mean breaking the bank on that whole-family gift but this will open up the budget for something special everyone can enjoy. 4) Buy experiences rather than things. Even low-cost tickets to something you can enjoy together with your spouse or as a family can mean more than an expensive gift that’s just going to get forgotten. Concentrate your gift-giving on experiences that will create memories rather than things that will create trash. 5) Give thanks rather than gifts to all the co-workers and extended family. Traditions were made to be broken. Just because the office does a Secret Santa every year or you usually buy for all the uncles, aunts, nieces and nephews doesn’t mean it has to break your budget. If you feel obligated to participate in Secret Santa, do it for a couple of days instead of the whole week. Buy one gift or experience for the entire extended family rather than an individual gift for everyone. Even with all this, it might still seem impossible to get out of Christmas without a short-term loan or borrowing a little. If you’ve truly cut everywhere you can and still come up short, there are ways to use debt responsibly without getting sucked into the trap. Don’t go to a payday or cash advance store! The actual interest rate on these are way higher than any other loan you can get. Consider taking out a loan to consolidate your debt along with Christmas spending. This will help you lower your interest rate and save money to make a little room in your budget. Compare rates on your credit cards with a personal loan before charging up your cards. A short-term personal loan is usually the better rate and will have fixed payments. Getting Christmas help to pay for Christmas doesn’t have to be embarrassing and holiday spending shouldn’t force you into a spiral of debt. Learn where you can find Christmas assistance programs and the steps that will make it a happy holiday without busting the bank.